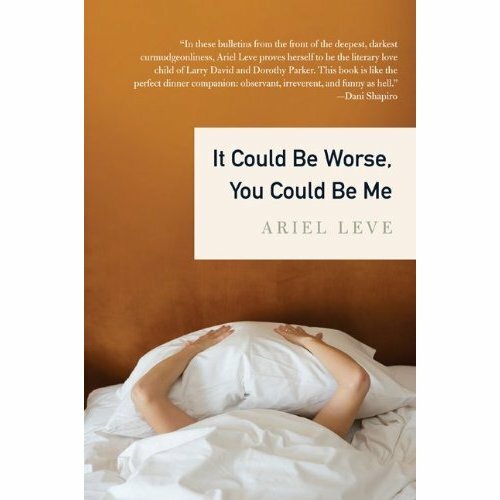 The instant I starting reading It Could Be Worse, You Could Be Me, I thought I had found a kindred sista-friend [Feminista author Erica Kennedy gave me the secret password to use that term] but also that I’d have to challenge Ariel Leve. She’s published a book. That’s better than I’ve done in the fifteen years I’ve been writing. I’m jealous of this talented woman and made her follow me on Twitter. She must be thrilled by the content of my tweets. Leve is a major pessimist, sets low standards to avoid disappointment, would rather stay in bed than get dressed and made up to go to a party that *might* not be worth her time. She expresses in print what most of us think. She’s observant, sharply critical and savvy. I tagged a plethora of pages in It Could Be Worse You Could Be Me. Leve’s irreverent voice and bittersweet outlook mingle in an erudite, esoteric manner. Don’t be scared away by her brilliance and underlying charms. She will seduce you with this collection from the first page. Even the optimists among you. She’s that good. Facebook– In real life, my friends are uninterested and distracted. But in cyber life people are very excited (!!!) about everything!!! The levels of emotion are off the charts. fake children– Why is it that there has to be a career that is preventing me from having a child? As though that must fill the tremendous void I have in my life, being childless and single. Maybe I just don’t want kids. Isn’t that enough? getting older–Forty is a tricky age because you’re old enough to get away with not going out, but not old enough to get away with not giving a reason. dating– Whenever someone says they like me I don’t believe them and don’t trust it. But only if I like them too. Wouldn’t it be great if men came with operating instructions to maximize their performance and shelf life? marriage– There are a number of reasons why I’m unhappy but not having a husband isn’t one of them. bras– I’ve done my own research and have found the only thing men really look for in a bra is that it comes off fast and easy. This entry was posted on April 5, 2010, 16:05 and is filed under Books. You can follow any responses to this entry through RSS 2.0. Both comments and pings are currently closed.